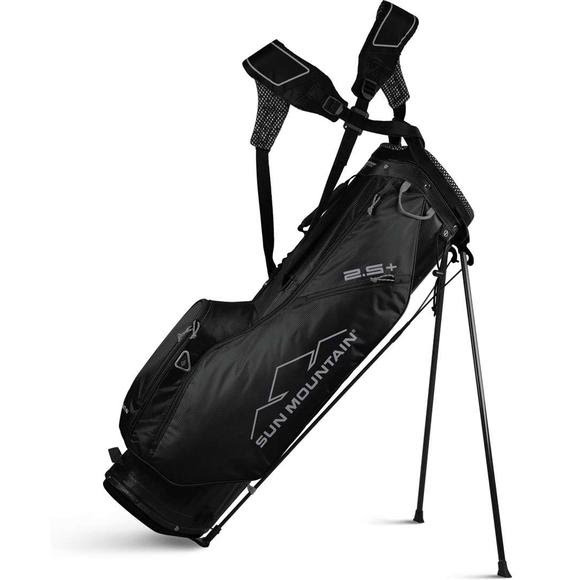 Designed for the avid walking golfer, Sun Mountain Sports' 2.5+ redefines the features that can be offered in an ultralight golf bag. It has contoured, high-density foam shoulder straps for maximum carry comfort, a roomy, 9.0 inch top and five pockets including a beverage pouch. All of this and it still weighs under three pounds! Designed for the avid walking golfer, Sun Mountain Sports &apos; 2.5+ redefines the features that can be offered in an ultralight golf bag. It has contoured, high-density foam shoulder straps for maximum carry comfort, a roomy, 9.0 inch top and five pockets including a beverage pouch. All of this and it still weighs under three pounds! The X-Strap® System is easy to get on and off and works well as a single strap for short carries. The new plastic strap guide provides effortless interaction between the straps.